Because after you try this chili you'll never go back to your old, boring chili recipe. I've been making chili for years--since college, really. And I always used my mom's recipe because, well, she's mom and she's an amazing cook and she made a pretty good chili when I was growing up. But some years ago I found this recipe in a Texas cookbook that my sister had given me. It's called "Roger Hicks' Cookoff Chili," but since I've tweaked it so much since I first started making it, I think I can now safely call it "Shelly's Chili Will Beat Your Chili in a Cookoff Any Day." So, now that it's fall and we're taking rainy-day walks with our dog, scuffling through the leaves, and wearing long sleeves, it's time for chili. Oh, and football. Isn't chili just the perfect food to eat when the game is on? Piled high with fixings like sour cream, cheese, and cornbread. Yum. So, now that your appetite is fully whetted, let's get down to business, shall we? 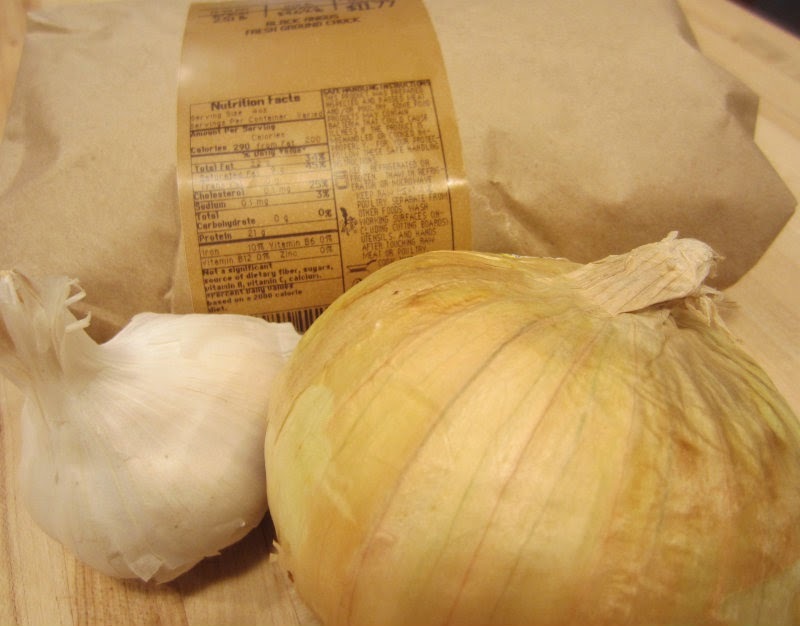 Start with the basics: ground beef, onion, and garlic. Let that "get happy," as Emeril used to say. Add your tomatoes and kidney beans. Sorry to all the true Southerners out there--I'm a Midwestern gal, and we here in the Midwest add beans to our chili. Only one can, though. We don't want it too heavy with beans. Next come the spices, some of which might surprise you: cumin, paprika, chili powder (duh! ), and cayenne pepper (just a dash). The real surprise, though, is the cocoa powder. And the sugar. 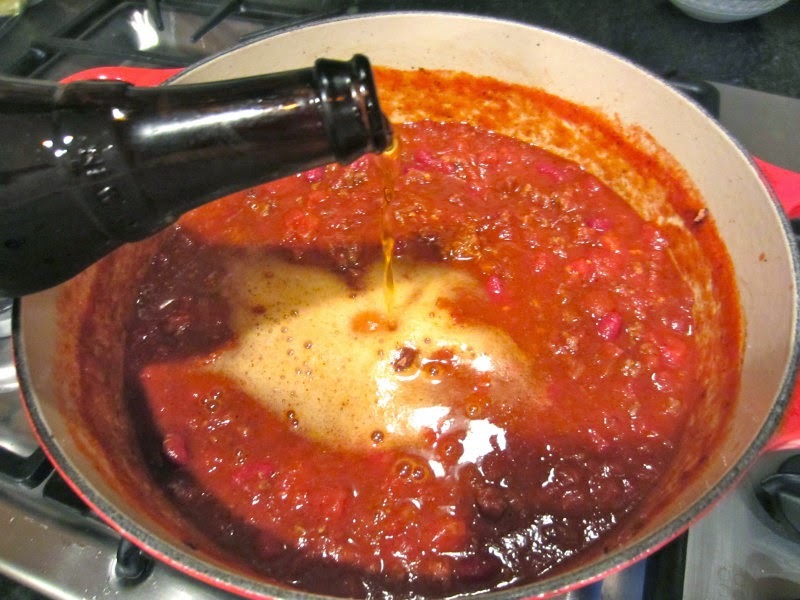 Mix everything together, then add what I think gives this chili its distinct flavor: beer. I recommend starting with a half a bottle, just to see what you think, but if you really like it, add the whole thing. Now let the pot simmer for a good three hours, uncovered. 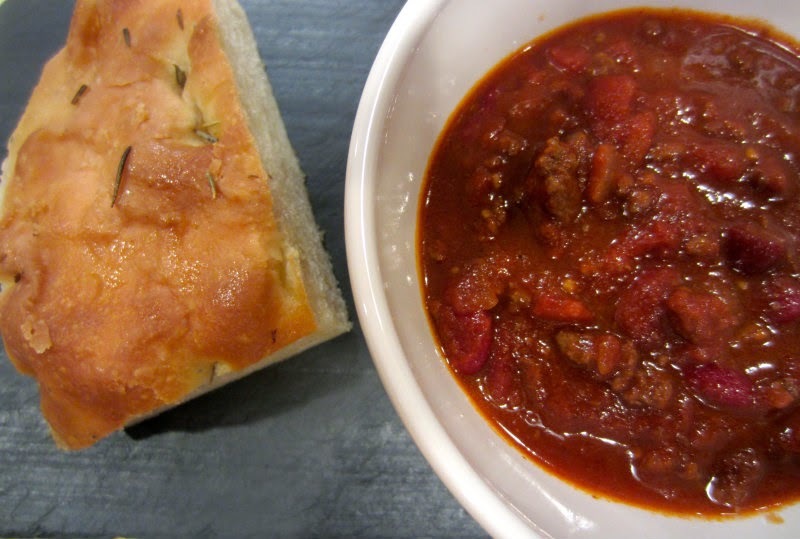 Just pop by the stove every now and then to give it a stir--don't neglect the chili. 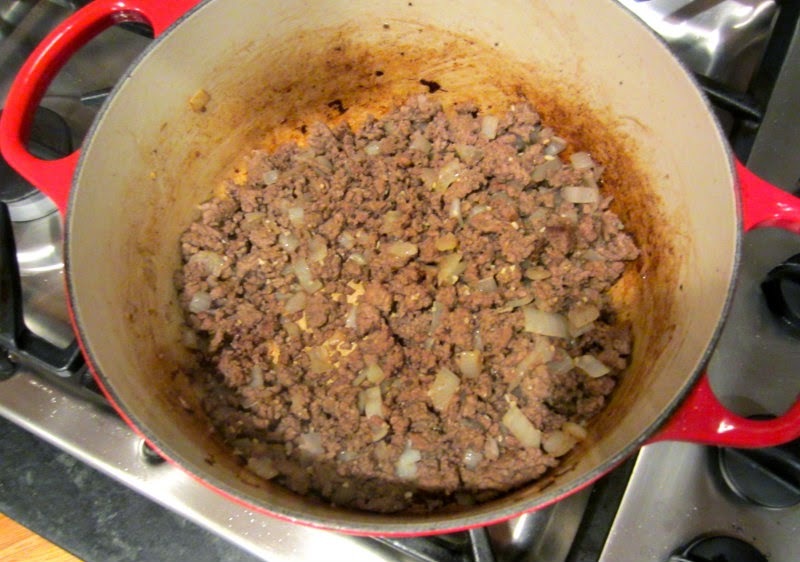 And if things start to get too thick, add a cup or two of water and let it keep simmering away. 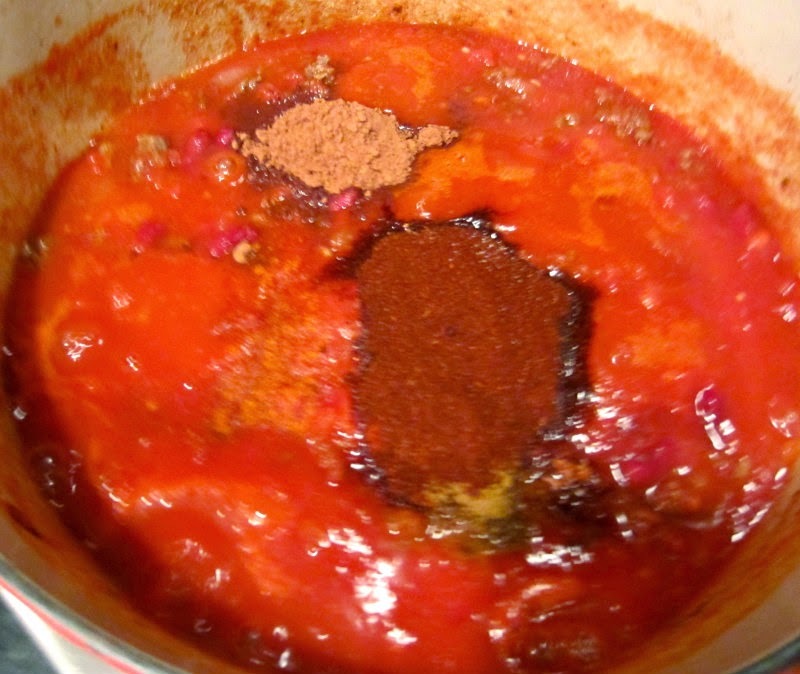 After three hours, your chili will become thick, rich, and have a deep red color that can only be developed with time. The flavors will come together so well, and you'll have the best bowl of chili you've ever had. Seriously, if you try this, please pop back here and let me know what you think. I hope you like this one as much as I do. Anyone who knows beans about chili knows that Texas chili ain't got no beans, but otherwise, that is pretty much my chili recipe. The cocoa is a "secret" passed down to me by my best friend's mama -- she used a few Hershey's Kisses if she didn't have any cocoa in the house (Who has Kisses, but no cocoa?). It's quite good. Not sure if it will EVER be chili weather here in Austin, but we eat it on Saturdays as we watch college football, anyway. Great one, Shelly. 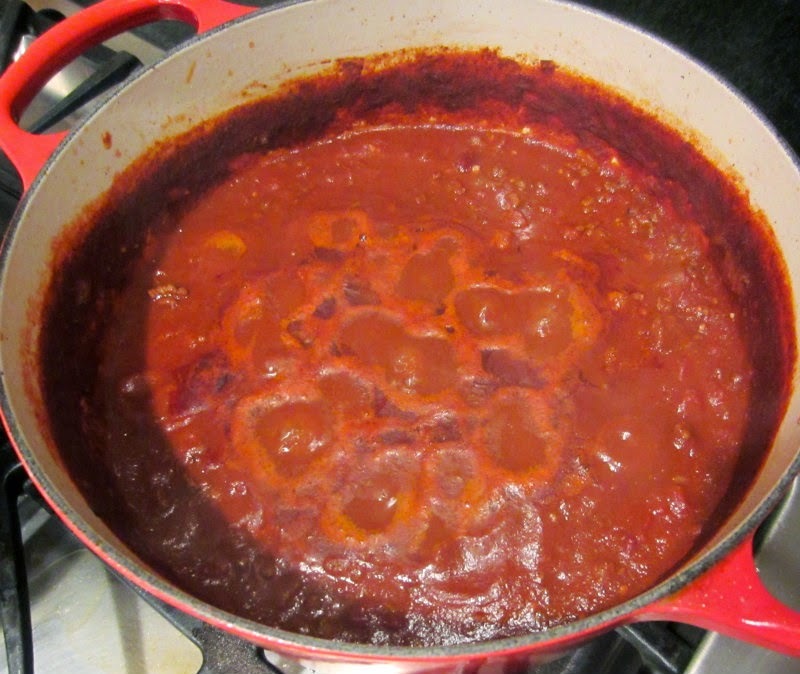 I always put brown sugar in my chili (and my spaghetti sauce), but I've never put cocoa in it. I'll have to give it a whirl!! One question about the beer . . . I do NOT like the taste of beer. Do you really taste the beer or does it just add a richer flavor to the chili?? 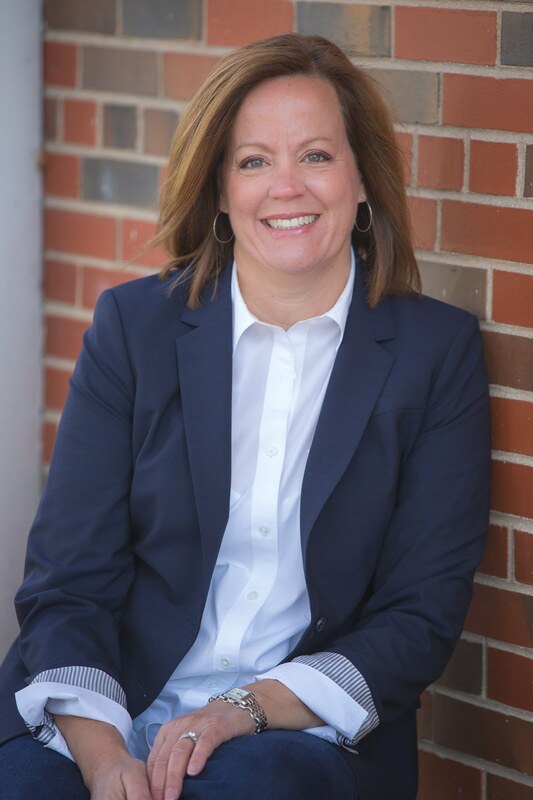 Blessings from Missouri!! Cocoa is a new one for me! I made a simpler chili last night for us, the first of the season. 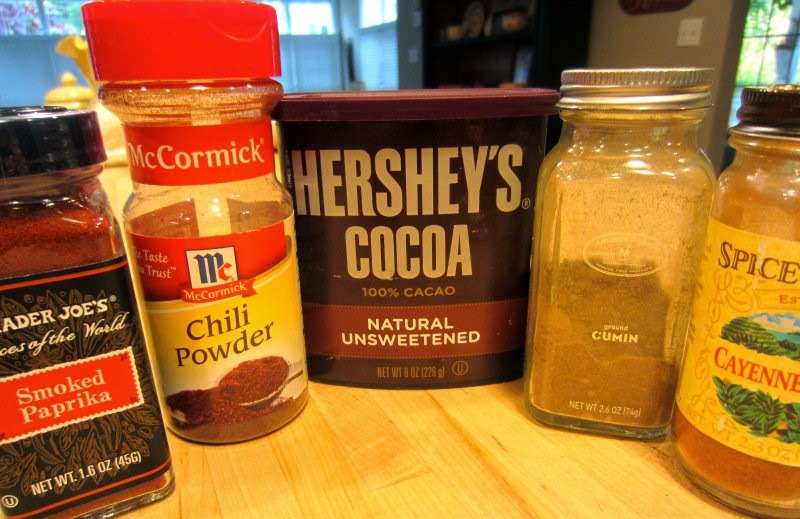 I often add beer to BBQ sauce and have added chili powder with a light hand to chocolate cake. We love chili and thankfully our youngest is past the too spicy stage!! Thanks for sharing. Have a good weekend. PS we used the same pot! DOTF, I like the taste of the beer in the chili. It's not too overpowering, but if you really don't like it, just substitute water for the beer. Linda, I've never put chili in chocolate cake. Hmmm. Might have to try that sometime! I'm from Texas and while it is true the many think chili shouldn't have beans in it there are just as many who enjoy the addition of beans. I'd love a bowl of your chili just as you prepared it…I'm sure it is terrific. I created my own chili from that recipe. It's a darn good base recipe but we have to have beans. 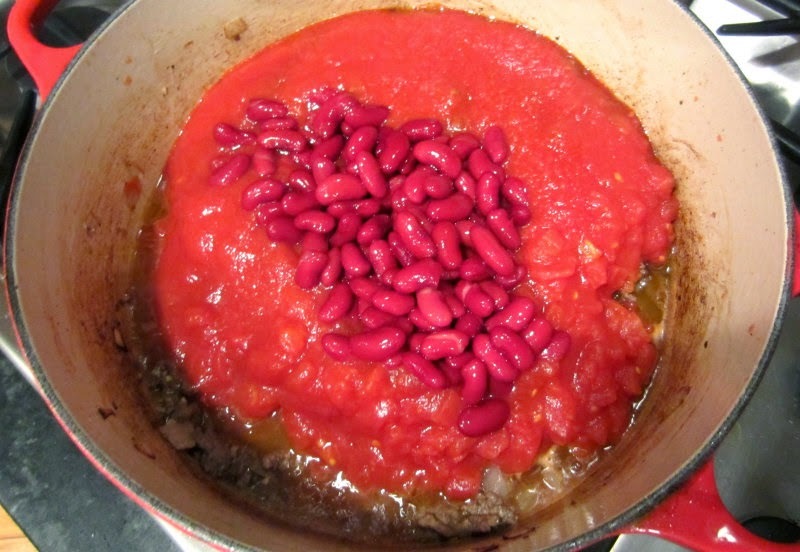 We use a mix of dried little red, kidney, and cranberry beans.